Digital Hyve is a digital marketing company in Syracuse, NY. Recently, they have experienced explosive growth, the best kind of growth! They went from a small group of two co-founders to 25+ employees and they are still growing! 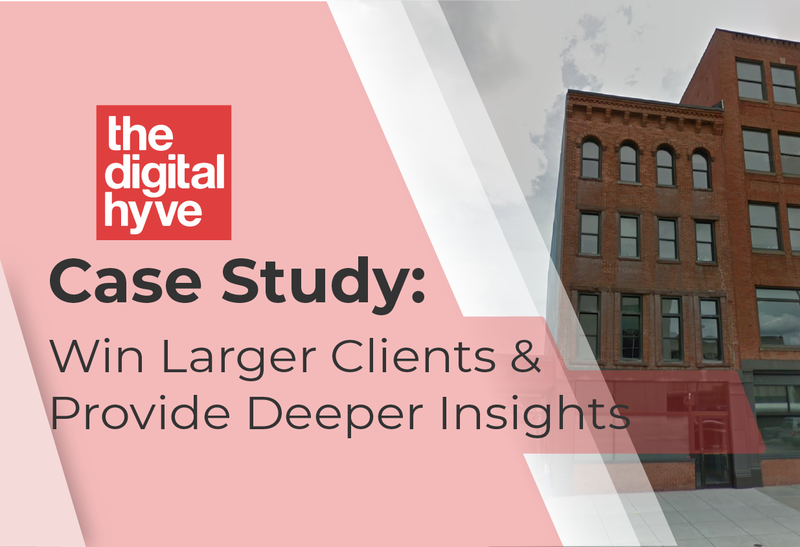 Christy Mulberger, the operations manager at Digital Hyve, was seeking an analytics and reporting solution that would scale with them. They needed a way to make reporting faster and automate the monthly cycle. They were also in need of aggregating data across several platforms so they could create different roll-up reports and one off reports. They also had to do this for 100+ clients. Through research and reviews they found NinjaCat to be at the top of the game. After sitting through demos with several vendors, they decided NinjaCat was the best solution for their needs. Client Reporting is paramount to Digital Hyve. They use reports to show exactly what they are doing for their clients. The goal here is client retention. NinjaCat was uniquely positioned to help Digital Hyve retain existing clients and start new client relationships that would carry on into the far future. NinjaCat allows them to communicate with clients on a regular basis. This in turn helps them to realize why clients hire Digital Hyve; RESULTS! Client reporting acts in a way to show the means to the ends and positions Digital Hyve as a leader in Digital Marketing. Before implementing the NinjaCat solution, reporting was done by downloading spreadsheets from Google, Facebook and others, and bringing some of that data into an Indesign template. This was a time drain on Christy as she was designing and finalizing reports from start to delivery. As Digital Hyve grew, they were going to need more people just to handle the new reporting needs of the growing company. That additional cost in new hires adds up. Most of the data was just number based. Christy wanted to be able to add insight to her numbers by expressing the data in different charts and pie graphs. Transition to more of a presentation than a report. They needed a scalable solution that would allow them to report to all 100+ clients. They wanted to be able to keep costs down and focus budget where it mattered most: expanding the agency.. They needed to automate because time is money. An overarching interest was in retention. Keeping clients, talking with clients regularly and gaining bigger whales were top of mind when they were choosing a reporting and monitoring platform. Digital Hyve now reports to over 100+ clients using NinjaCat. The solution scales with them as they continue to grow. All of their clients are now getting high-quality reports each month and can monitor KPIs or check in on AdWords with their very own Dashboard. The Account Managers have more time with their client’s. They feel a strong sense of confidence in the work Digital Hyve does and the reports that show them off. Client’s have a deep understanding of what the data is showing. And what is working! The reporting cycle is down from 2 weeks to a couple of hours. Management has maintained a competitive edge with the new reports and targeting bigger clients is even easier for the sales team. The retention rate has increased and they can continue to grow without headaches. The analytics team has highly accurate data to make thoughtful insights and can now mix between channels and aggregate data. 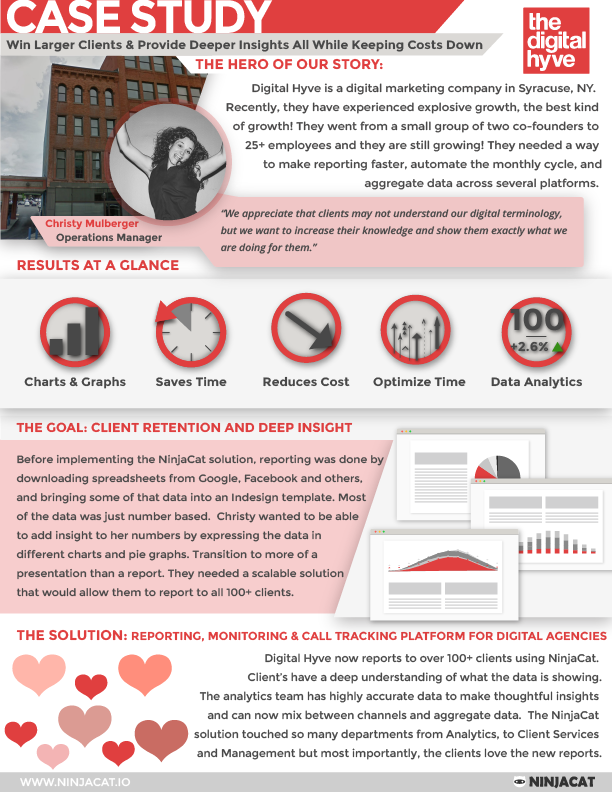 The NinjaCat solution touched so many departments from Analytics, to Client Services and Management but most importantly, the clients love the new reports. Take the NinjaCat test and see if our solution is exactly what you and your clients need. Sign up for our quick demo and see the potential of the NinjaCat reporting solution for digital marketing agencies. Client Reporting is paramount to Digital Hyve. They use reports to show exactly what they are doing for their clients.